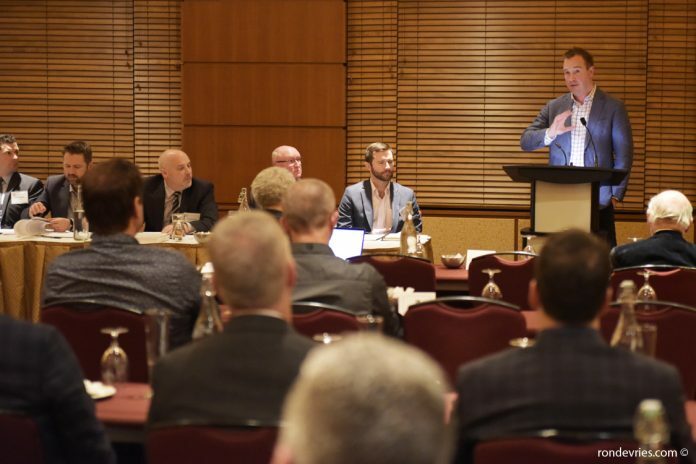 The General Contractors Association of Ottawa (GCAO) has reported a healthy year, both financially and in the number of tendering practice issues it reported and resolved. Yves Beaudoin, co-owner of Jumec Construction Inc., took the gavel as 2019 president from outgoing president Russell Grass, a partner and senior estimator at Waterdon Construction Ltd., at the association’s annual general meeting on Jan. 24. “Our tendering practices committee has met with numerous owners over this past year,” Grass said in his closing speech. “Our biggest win was finally meeting with the CECCE (Conseil des écoles catholiques du Centre-Est) to open a dialogue which we have been advocating for at least the past three years. Our meeting resulted in the school board agreeing to release all tender results via e-mail post tender closing.” For years, the school board had declined to make tender results available after closing. The association had less success with Carleton University. Beaudoin, who led the tendering practices committee in 2018, said the association raised the issue of not giving out tender results in December. “We are open for discussions,” he said. Financially, the GCAO reported a $7,850.82 surplus, bringing the members’ equity to $98,199.03. Much of the savings resulted when Alison Hogan left as the association’s co-ordinator mid-year. The association also had a net gain of two members, with four organizations joining and two leaving. In the treasurers’ report, Sandro Guarna wrote that the GCAO has decided to partner with the General Contractors Alliance of Canada with a $2,500 annual fee, as the national group works to advance the general contractors’ perspective on upcoming federal prompt payment legislation. The GCAO also updated its website for $4,395 . President: Yves Beaudoin, Jumec Construction Inc.
Past-president: Russell Grass Jr., Waterdon Construction Ltd.
First vice-president: Bruce Norman, PCL Constructors Canada Inc.
Directors: Gaetan Lacroix, Trottier Construction; and Josh Laginski, Frecon Construction Ltd.